Nifty weekly candle closed flat making long legged hammer at extremely oversold zone . possibility of selling climax according to volumes . Nifty Closed at bottom of uptrending channel just above 200 week moving average and at lower bollinger . Expecting one more weekly flat closing or looking up towards 5575 5690 down side support will be at 5350 , buy on dips if nifty will sustain above 5350 weak only below 5350 . Trading the channels is a trading strategy that identifies stocks trading in trending channels. While in a up trending channel, by finding major support and resistance levels with technical analysis , a trend trader buys stocks at the lower level of support (bottom of the up channel) and sells/short them near resistance (top of the channel). In a down trending channel the trader may also go short (bet against the price) at upper resistance levels and sell their short positions at lower positions within the channel. Nifty is trading above very strong support of 200 week moving average. If we are predicting these calls seeing real time charts based on our analysis technique why can’t you … Start learning and earning and grow with Dhanvarsha . send add request to kailash123p@yahoo.co.in / kailashnpoonam@gmail.com or call at +91 9451659275. Negative to gap down opening is expected with extremely volatile session ahead as today market players will plan and set for next expiry and initiate their positions accordingly. Nifty eod chart may support bulls as money is coming in to market RSI is creeping up. after long legged hammer 2 white candles in continuation , prices are still below from falling trend line and 20 DMA in these conditions 1 more white candle may be there and we may see nifty spot at or above 5450 if GDP data or $$ will be supportive. Trade in bullish pattern till nifty will trade above 5350 . Stay logged in at chat room . 29 Aug 13, 06:47 PM [×] [o] deepakgajra: yr sl hit na? Later traded below 236 …. calculation is theoretical but yes 10 points were predicted in call and shared at chat room http://dhanvarsha.in/chatroom/ so we can say it as Jackpot call . Gap down of 1 % or more is expected with extremely volatile session ahead. 5200 5000 4800 may work as supports as per 5 years weekly chart .Nifty is trading well below 200 week moving average, if pull back won’t be there, more down side can not be ruled out . Be cautious … Go for intra trades with proper stop loss management . Do not carry long positions till global and domestic conditions are not ok for markets . Spot bullish and bearish waves then enter in trade . Stay logged in at chatroom dhanvarsha http://dhanvarsha.in/chatroom/ for real time updates and tips /calls . Nifty may retest its key support 5200 5230 within 1 week ..if it is only double bottom then rebound will be there to 5500 before Friday close .Chances of pull back /smooth recovery can not be ruled out if aggressive sell off with volume below 5230 won’t be there. Possibility of gap down opening is there as per market out look NF will trade with increased volatility , global sentiments are bearish , dow closed below 15k at 14,946.46 64.05(0.43%) below 15k psychological mark and rating firms are seeing more gloomy situation ahead warned to downgrade . The government might be taking measures to address the macroeconomic woes but the worst is yet to come, rating agencies have said. Fitch Ratings warned of a downgrade if the country is unable to meet fiscal deficit target. It said reining in the fiscal deficit at 4.8 per cent of gross domestic product (GDP) would be a difficult task. Finance Minister P Chidambaram had said a fiscal deficit at 4.8 per cent of GDP was a red line and would not be breached. But Fitch said slowing revenues would make it difficult to meet the fiscal deficit target in the year ending March 2014. The rating agency had assigned India its lowest investment grade of BBB-. We are expecting positive closing today . Session will be extremely volatile so entry and exit must be fast . Do not trade without stop loss order as stop loss order will protect your capital and unexpected losses. 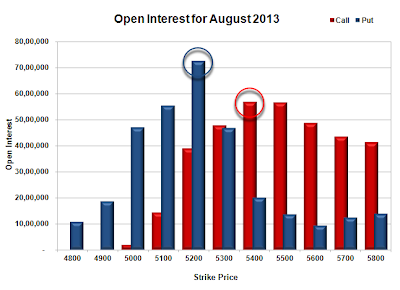 See the option decay sold 5500 ce 5400 PE call combo at 84 traded at 56 at the time of close . huge gains were there on both calls and puts . [×] [o] admin: natural gas 224.60 bang on target BOOK full profit. Positive to gap up opening is expected with extremely volatile session ahead .To read more about nifty expiry view with analysed nifty weekly and daily charts please visit http://dhanvarsha.in/nifty-macro-and-micro-analysis/ . Trade with trend and trade with stop loss order. 5500, 5575 and 5690 are pivot / reversal levels so buying with volumes must be there to cross these barriers . as per eod nifty chart ,candles are supporting bulls ..next negative wave may take nifty to 5180 5000 level, falling / correcting chances are grim .looking up now . next week will be extremely volatile …spot trend and trade according to it ..trade mostly in intra day trades and carry those stocks which are at breakout level .possible range for next week will be 5300 >< 5500 can be extended to 5700 if short covering will take place ..
Nifty weekly chart is showing that fifth week closing candle was long legged red hammer .Indication of pause in fall and possibility of some pull back or complete reversal is there . Technical analysis is nothing but just trade according to direction of one line …we use very simple technique in it …for intra day trades if candles are closing below green line we plan short trades and if candles are closing above green line and line is pointing up we plan long trades but when candles are hovering up and down of line we must avoid trades. crude traded above 6928 more than 200 points up means loss of 20000/- if not traded with stop loss order ..
so what is gud here booking of 20k loss or booking of 1 to 2k loss in form of stop loss order . at 2.14 high was 5453 and at 2.18 low was 5412 .. Thus traders gained 20 to 40 points if they were at desk and alerted. Admin: expecting flat to slightly negative opening with possibility of extremely volatile session ahead may close above 5350 …market will be weak only if move below 5260 with volumes and that will be there only if more negativity will be spread . Fresh short build up or selling climax in Nifty ? 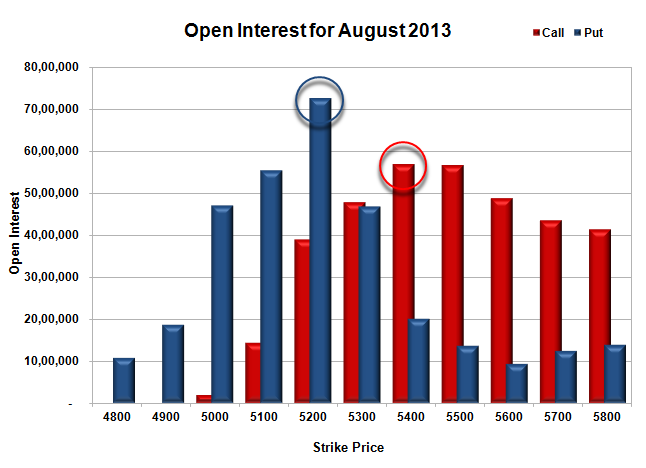 Addition of 34 44 800 shares in open interest with fall of 100 points seems that fall is supported by fresh short positions ….if it is true nifty will see 5k soon ..but if it is deception or selling climax then sharp reversal can not be ruled out ..see OI increase is highest in this series .even on expiry day oi increase was 32 95 900 . A market condition that is characterized by very high trading volume and a dramatic downward or upward movement in price. High volume and downward price movement indicate a selling climax, while high volume and upward price movement indicate a buying climax. Either type of climax signals the end of a trend. Selling into a climax run can be a good exit strategy, because by selling during a period of euphoria, investors can lock in dramatic gains. A buying climax can bid a stock’s price up to levels it will never reach again, or that it will not reach again for at least a decade. At the end of a buying climax, prices can fall sharply as investors realize the stock has been overbought. Most true Selling Climaxes, if not all, have been produced by distress selling … They have come at the end of rapid and comprehensive declines which exhausted the margin reserves of many speculators and necessitated the dumping of their shares at whatever the market would bring. This process is progressive — feeding upon itself, so to speak — with each wave of forced sales jeopardizing another lot of margined accounts, until at last millions of shares are tossed overboard, willy-nilly, in a final cleanup. [×] [o] Admin: expecting flat to slightly negative opening with possibility of extremely volatile session ahead may close above 5350 …market will be weak only if move below 5260 with volumes and that will be there only if more negativity will be spread . [×] [o] Admin: positive newwwwwwwwwwws—–Asian shares pared earlier steep declines on Thursday after activity in China’s manufacturing sector hit a four-month high in August. Japan’s benchmark Nikkei index neared 13,400 points, Australia’s S&P ASX 200 moved off its two-week low, South Korea’s Kospi rose above its one-month low and the Shanghai Composite reversed losses. [×] [o] Admin: Shanghai 0.2% higher China’s benchmark index reversed early losses to enter positive territory as investors cheered the latest PMI figure. Nikkei flat Japan’s benchmark index also erased losses to cross 13,400 points after losing as much as 1.4 percent earlier in the session thanks to a weaker currency. [×] [o] Admin: so you are seeing consolidation here at 5250 or reversal ? Gap down opening is expected with possibility of gap filling as maximum stocks are trading at 52 week lows and bottom fishing is going on if not positional you can buy stocks when you spot bullish wave as we have advised at chat room http://dhanvarsha.in/chatroom/ and results were encouraging . you can stay at room and enjoy such calls . when market moves up we search for resistance and when market start falling we search for supports human /traders nature thats why market runs..
possible crucial levels for Nifty spot are 5350( very strong )5450 5600 5800 6050 if 5350 will be broken then 5300 5200 4760 4580 3670-each and every level may work as support /resistance level current support is 5350 and resistance is 5450 as per 5 years weekly chart of nifty . as 5350 is 200 week moving average . axis bank advised to buy at 1007 at chat room http://dhanvarsha.in/chatroom/ and bang on target one. market moves in positive and negative waves in each time frame ..waves may be in shape or not but they follow certain rules ..stay at dhanvarsha chat room to learn more in real time …and make money in markets..
[×] [o] Admin: nifty advised to BUY at 5415 by renuji and it traded low at 5414 and high at 5461 after her call will u not say thanks to her ??? Gap is there and pivot is also there so after gap down opening both gap filling is possible if this gap wont filled soon 5450 5500 level will start working as very strong resistance and market may trade even below 5350 5000 4700.
weekly chart is showing that 5350 is very gud support for nifty ..
maximum indicators were supporting bulls on 14 August but Nifty was closed at pivot level and 61.8% Fib retracement level and now we can say that both have proved their importance … and nifty forced to reverse its direction and closed at triple bottom level . U.S. stocks fell slightly on Friday, and the Dow industrials posted the biggest weekly loss this year as rising bond yields hurt shares paying richdividends and earnings from retailers disappointed investors. The Triple Bottom Reversal is a bullish reversal pattern typically found on bar charts, line charts and candlestick charts. There are three equal lows followed by a break above resistance. As major reversal patterns, these patterns usually form over a 3 to 6 month period. Prior Trend: With any reversal pattern, there should be an existing trend to reverse. In the case of the Triple Bottom Reversal, a clear downtrend should precede the formation. Volume: As the Triple Bottom Reversal develops, overall volume levels usually decline. Volume sometimes increases near the lows. After the third low, an expansion of volume on the advance and at the resistance breakout greatly reinforces the soundness of the pattern. Resistance Break: As with many other reversal patterns, the Triple Bottom Reversal is not complete until a resistance breakout. The highest point of the formation, which would be the highest of the intermittent highs, marks resistance. Resistance Turns Support: Broken resistance becomes potential support, and there is sometimes a test of this newfound support level with the first correction. Price Target: The distance from the resistance breakout to lows can be measured and added to the resistance break for a price target. The longer the pattern develops, the more significant is the ultimate breakout. Triple Bottom Reversals that are 6 or more months in duration represent major bottoms and a price target is less likely to be effective. 5715 and 5682 are levels very crucial if 5682 will be broken with volumes nifty will not easily recover and if moved up above 5715 with volumes no turning down so we can say that zone between 5682 -5715 is traders action zone and in this zone vary cautious view and trades to be executed with proper and strict stoploss. : Foreign investors seem to be increasingly wary about investing in India as the Reserve Bank of India battles to stem the rupee’s plunge and stop capital outflows that are pushing India toward its biggest crisis in more than two decades. On Wednesday, RBI Governor Duvvuri Subbarao tightened rules on overseas investments to prop up the rupee. He cut the amount Indian companies can invest overseas without seeking approval to 100 percent of their net worth, from 400 percent. The move is expected to scuttle plans the Aditya Birla Group, Apollo Tyres and Cipla had to invest abroad. Indians can only remit $75,000 a year versus the previous $200,000 limit. “It’s fire-fighting to save the rupee, but where does it leave my investments if the Indian government suddenly introduces new controls in the future that restrict me from repatriating my profits,” said Boston-based medical equipment manufacturer Harvey Kirpatrick. [×] [o] Admin: chacha kya koi trader aapse hyderabad men milna chahe to aap milenge ? [×] [o] deepakgajra: chacha gujrat se hai? [×] [o] deepakgajra: ateyare ? [×] [o] veera: July WPI inflation data due around 12 noon. [×] [o] Admin: chacha aapka yahoo id aap share karoge trdaers se ? Flat to slightly positive opening is expected with choppy session ahead and possibility of flat closing …market may consolidate and trade in 30 to 40 points range ahead of 15 Aug holiday . deepakgajra: nifty ko kon khich raha hai? Bank Nifty Future - Is it Critical?